The young lawyer for whom Cook County was named was a landowner in early Springfield and the man who prodded the Illinois territorial legislature to apply for statehood. 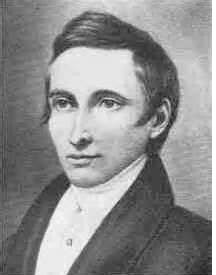 Daniel Pope Cook was born in Kentucky in 1794 and moved to Kaskaskia, Illinois in 1815. There, he studied law under his uncle, Nathanial Pope, the U.S. congressman for the Illinois Territory. Cook also was mentored by his father-in-law, territorial Gov. (and later state governor) Ninian Edwards. Cook was named the territory’s first auditor general in 1816, but soon thereafter went to Washington, D.C., to further his political career. President Monroe sent him on to London with dispatches for John Quincy Adams. Cook came back to Illinois in November of 1817 and took it upon himself to write a very persuasive article for the newspaper in Edwardsville, which he co-owned, that laid out the reasons Illinois should become a state instead of a territory. The territorial legislature took up the call, and by Dec. 10 sent off its appeal for statehood to Congress, where Nathanial Pope presented the document. The legal process for statehood was finalized on Dec. 3, 1818, making Illinois the 21st state of the union. Cook was elected Illinois’ second representative in Congress after statehood and was re-elected three times, serving from 1819 to 1827. At the time Illinois as allowed but one representative; as that representative, Cook had a significant impact on legislation affecting the state. With statehood achieved and an Indian treaty signed, numerous settlers were drawn into the central part of the state, known as “the Sangamo country.” The area had a reputation for well- drained prairies outlined by streams, woodlands with plentiful wildlife, and productive soil. The area remained federal land until surveys were completed and a land office opened for sales in 1823. Sangamon County (much larger than today) was created in 1821, and Cook took an interest in the newly created county. He had a cabin built and 10 acres of land plowed, thus making known his desire to purchase land. Elijah Iles had built a store in the tiny community of Springfield, which had been designated the temporary county seat, and is credited with a movement to establish a platted town. Iles set about making agreements with other settlers not to bid against him and three other men at the land sales set for Nov. 6, 1823. Cook apparently intended to be one of the other three original buyers, along with John Kelley and John Taylor, as implied in an Oct. 21, 1823, letter from Iles to Cook. However, the letter brought bad news. 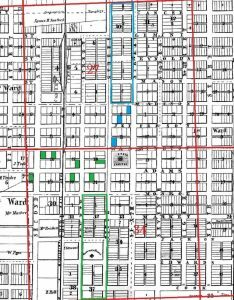 Kelley had died, and the quarter section of land Taylor was to buy had been set aside as “seminary land,” the sale of which was to be reserved and profits set aside for higher education. A document written by Pascal P. Enos later records that Cook had made improvements to the land, which Enos evidently purchased through a local intermediary, maybe Iles. On Nov. 7, 1823, Iles, Enos, and Thomas Cox (replacing Kelley) purchased three planned quarter sections of land and platted a town. Taylor finally bought his quarter section a year late, after a letter to the governor resulted in its re-designation. Cook visited the Sangamo area at least once, if not more often, as verified by an article in the Edwardsville Spectator on July 12, 1823. The article says Cook and Gov. Edward Coles were invited to the Springfield area for a Fourth of July celebration. Toasts were given to the two men, and then Cook gave a toast that was quoted in the newspaper. Iles was identified as another of those present. Unfortunately, it is not known what Iles and Cook may have discussed about a future town or what other meetings they may have had. In 1826, after losing his bid for a fifth term in Congress, Cook again showed an interest in Springfield. This time he bought land from Iles, Enos and Cox. In February, he bought from Enos seven town lots and a 16¼-acre outlot for $50, along with three town lots and another 16¼-acre outlot, also for $50, from Iles. In May of 1827, Cook paid Cox $100 for a 26-acre tract. Although respected, intelligent, politically astute, sociable, and an eloquent speaker, Cook was physically frail. He died at age 33 on Oct. 16, 1827. He was memorialized four years later when Cook County was named. In Springfield, Daniel Pope Cook is remembered by a street name. In 1836, Iles filed the plat for a 27-block addition to Springfield in anticipation of the town becoming the state capital. 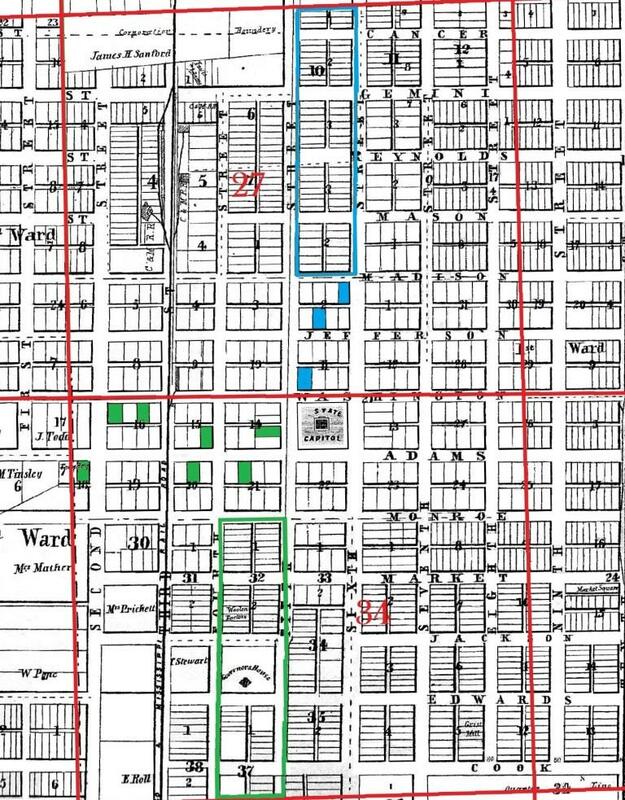 He named its east/west streets Market, Jackson, Edwards, and Cook. Market (today’s Capitol Avenue) got that name because Iles set aside an area for a vendor market between Ninth and Tenth streets. Iles presumably chose the name Jackson following the original town plat’s pattern of using president’s names; Andrew Jackson was president at the time. Edwards Street honored Ninian Edwards. Finally, Iles named a street after the man whose legislative work helped advance Illinois and with whom he had had a personal acquaintance: the late Daniel Pope Cook. The Cook name also lived on in Springfield through Daniel Cook’s only son, John Cook, a Civil War brigadier general and mayor of Springfield, and his grandsons, John Crammer, James L. and William J. Cook. Daniel Pope Cook married Julia Catherine Edwards, daughter of Ninian and Elvira Edwards, on May 21, 1821. They had one child, John Cook (sometimes reported as John Pope Cook). He was only 2 years old when his father died in 1827. Julia Cook died three years later, and John Cook was raised by his grandparents, Ninian and Elvira Edwards. Following Daniel Cook’s death, his Springfield land was sold at auction to pay a debt. It was purchased by the widow Elvira Edwards. At Elvira’s death in 1839, her son Benjamin S. Edwards and grandson, John P. Cook, were heirs to the land. “Oak Ridge Cemetery says they have no information on Daniel Pope Cook’s burial. I checked with the cemetery for the burials listed in the Lamb (Block 1- Lot 188) and Edwards (Block 10-107) family plots. They told me it was not unusual for a family to put other family member names than those buried at the site on a monument. I also inquired about purchasers of lots and was told early purchasers generally were not recorded. “Daniel P. Cook’s name does appear on the James L. Lamb obelisk. (Only parts of the name are now readable; the other information given is illegible.) Why is Cook’s name on the Lamb family marker? Lamb’s daughter Susan married Daniel Cook’s son, John Pope Cook. John and Susan Lamb Cook each have individual stones at their graves in the Lamb family plot. Illinois in 1818, Solon J. Buck, 1967. Sangamon County Deed Books, Sangamon County Recorder of Deeds. Illinois: A History of the Prairie State, Robert P. Howard, 1979. Early Federal Land Sales (within the Present Boundaries ) of Sangamon County, Marilyn Mendenhall, Marilyn and J. Roger Ball, Sangamon County Genealogical Society, 1978. Early Settlers of Sangamon County, John Carroll Power, 1876. “Daniel Pope Cook,” by Josephine Burns, Journal of the Illinois State Historical Society, 1913. Contributor: Linda Garvert, a former librarian at Lincoln Library’s Sangamon Valley Collection, is historian of the Elijah Iles House, 628 S. Seventh St. in Springfield. This entry was posted in Prominent figures, Springfield, State government. Bookmark the permalink. Great research by Linda Garvert. Please take on the Pasfield estate that bounded Pasfield, Edwards, New and Capital formerly market.